It’s a crisp, sunny Thursday morning in Pocatello, Idaho. The sun has just come up over the hills, casting warm rays over the city and thawing a large rock face that has become a favorite for local climbers. As the city wakes up, the air is filled with sounds of birds are chirping and the rhythmic hum of Sam Kreig’s sewing machine. 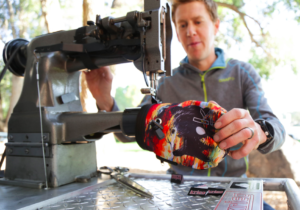 Kreig Climbing makes bags for climbers, cyclists and outdoor adventurers. It all started when Sam wanted a chalk bag that had some character. When he couldn’t find one on the market, he bought some cheetah fabric, sat down at his sewing machine and created his own. Other climbers quickly took notice and pretty soon Sam was taking customer orders. Twenty years later, Kreig Climbing has grown into creating bags of all shapes and sizes, all of which are made with high quality materials and endless color combinations. 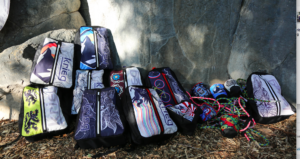 In addition to the chalk bag that started it all, Kreig makes bicycle saddle bags, multicalvas and most recently came out with a line of backpacks that will make their debut this fall. The backpacks are straightforward and stylish, designed with the crazy patterns and colors that Kreig is known for. Each backpack zips down the middle to access the pocket on the inside and features a side pocket to carry a water bottle.